Experts in renovation of club chairs, club sofas and other antique furniture of art deco and vintage located in the center of Brittany, we offer a renovation of the old days that respects the original leather, as well as a wide choice of Club sofas and club sofas and other antique and vintage lounge furniture renovated. Enthralled by the timeless and classical charm of the club chairs, their comfort and the durability and durability of the leather, we started our activity and founded the leather workshop in 1993 with the aim of reviving the " Patients "among these exceptional furniture. Since then, we have been able to breathe life into innumerable club chairs, club sofas and other furniture from the Art Deco period and vintage leather furniture, using old upholstery techniques and natural materials high quality. Since 2001, the leather workshop has been installed in the Côtes d'Armor department, in Callac, in the center of Brittany. 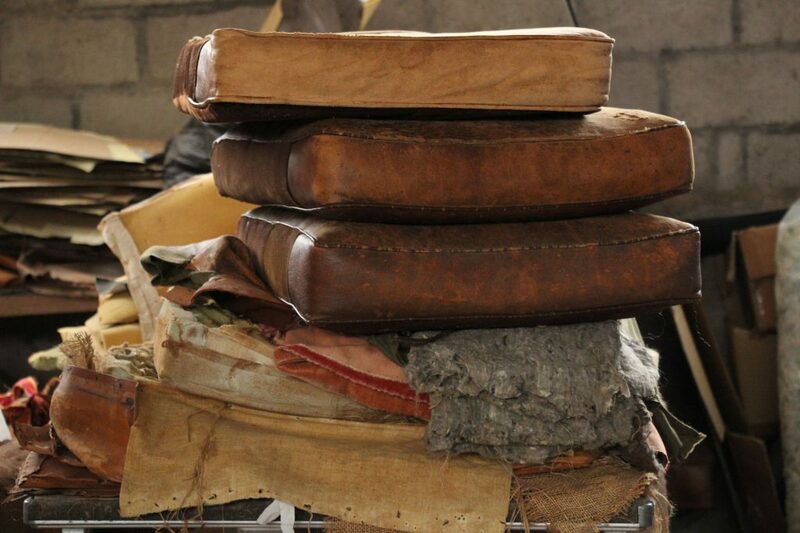 L'atelier du cuir -Brittany offers the renovation of your club armchairs, club sofas or other antique leather furniture. 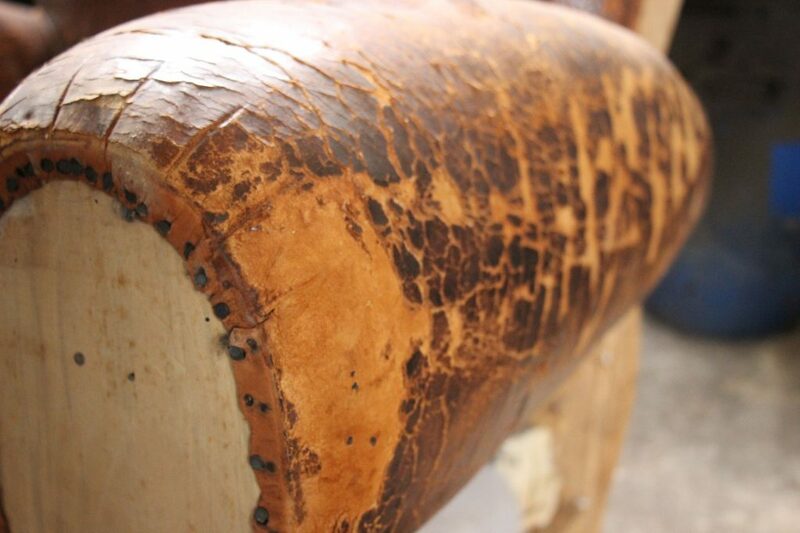 The restoration of leather club chairs is carried out either by retaining the original leather (if possible) or by replacing the leather with a new skin patina in the old or by a colored skin. For longevity and durability, we prefer to work with cowhide leather and not with basan. Depending on their condition, we try to also keep the original nails, while the straps are replaced. The padding of the cushions is completely exchanged. If you have a contemporary leather lounge, it is possible to renovate, recolor or change the color. The renovation stages consist of stripping and degreasing the leather, recolouring or staining, and then waterproofing it. A club armchair is a traditionally leather armchair, which combines sleek lines, comfort, durability and luxury. It is a furniture typical of Art Deco (years 1920-30). Originally French, this piece of furniture was initially known as "comfortable armchair", being the opposite of a chair less wrapped and straighter (and therefore less comfortable). Its current name probably stems from its use in the English and French gentleman's clubs of the 1930s, clubs reserved exclusively for men, where it was often used to furnish reception rooms and salons. Since then, this armchair, which has become a classic and timeless piece of furniture, has gone out of the clubs and entered the salons of all those who are looking for comfort while maintaining simple and refined shapes, longevity and luxury. Made by hand and made to last in time, each armchair is a unique piece, with high sentimental value, worthy to be passed on to the next generation. © 2017 l'atelier du cuir - bretagne, Web-agency: Web & App. After the first successful first renovation, Thierry Perrodou started his second club chair. This one was a club chair with gendarme hat. It was an old vintage seat, the armchair was dating back to the 1930s. At first glance, this poor chair did not look as he had managed to find in a barn watch, completely covered with dust and straw. There was even a nest of pigeons on the seat! 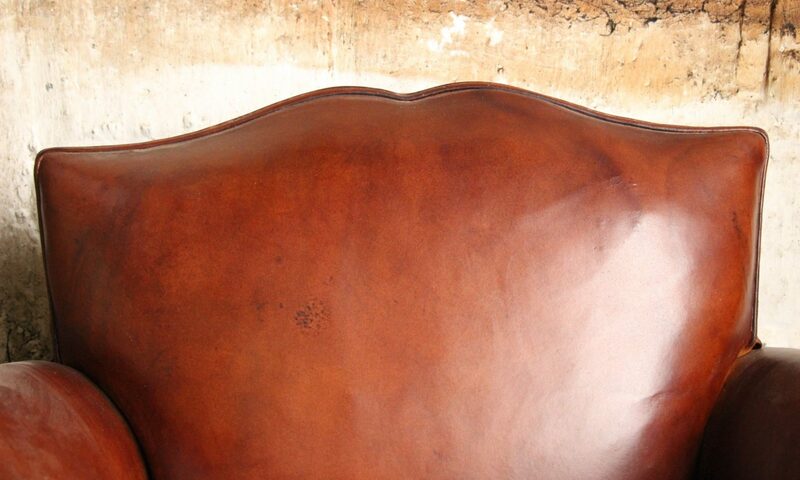 The leather of this poor club chair with a gendarme hat was extremely damaged. The artisan Thierry Perrodou had to remake this armchair club entirely. The renovation took him very long. He had to tighten no-sag straps and springs. Then he made padding armrests and armrests with vegetable hair. The padding of the cushion, which he had to make in new leather, was partly made of feathers. Then he skated the old-fashioned leather, of a beautiful brown cognac color. The club chair with gendarme hat was completely restored. Over the years, artisan Thierry Perrodou has become very famous and famous in the region of Callac Brittany, Côtes d'Armor, Finistère , Morbihan, Ile et Vilaine, in short, the whole of Brittany for its craftsmanship. The buyers come from everywhere, even from France and abroad to buy its restored furniture. As it not only sells restored leather club chairs or renovated club chairs, it also sells refurbished club sofas and restored club sofas. Whether it is a hat file, a straight back, a backrest with a flower, a mustache backrest, in short, all the forms of club leather armchairs and club sofas of the 1920s, 1930s, 1940s, 1950s and 1960s. The craftsman also likes the furniture of Art Deco, he also renovates them to resell after: armchair, sofa, full lounges, pair of armchairs, coffee table, dining chairs, office armchair. Each time, these beautiful antique and vintage furniture can, thanks to their renovation and restoration of leather, find their former splendor.